BAKERSFIELD, Calif. — It takes dedication, consistency and hard work. “I knew right away when we first started that he would be special," said coach Rod Chronister. "A guy like Daniel coming a long is once in a lifetime for a coach." Following in his older sister's footsteps at eleven-years-old, Daniel Viveros took on the shot put role under Chronister. “I just came out and saw how far other people were throwing and just thought, ‘oh I could do better than that, so I just jumped in," said Viveros. Since then, Viveros has made a huge splash. This past weekend, Viveros threw 68 feet and 11 inches, topping No.1 in the country this season and No. 2 in Central Section history. “I was expecting a big throw, but not as big as that throw," said Viveros. "But, it just felt good as soon as I let it go." The 2018 defending boys state shot put champion will be attending the University of Mississippi upon graduation. “Randomly, Coach Smith texted me and was like, 'Hey, I have a full ride for you if you want to come out for a visit,'" said Viveros. But, before he sets off to break even more records on the collegiate level, he wants to make the most of this final shot. 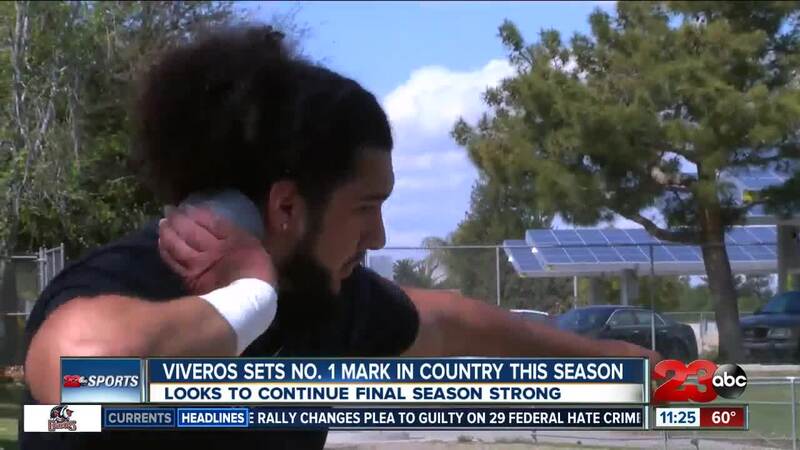 “Hopefully [I hit] 70 feet, that’s a big number for throwing for shot put, just defend my state title, and just win," said Viveros.